Fava beans, in both fresh and dry forms are originally from Northern Africa and the Mediterranean. 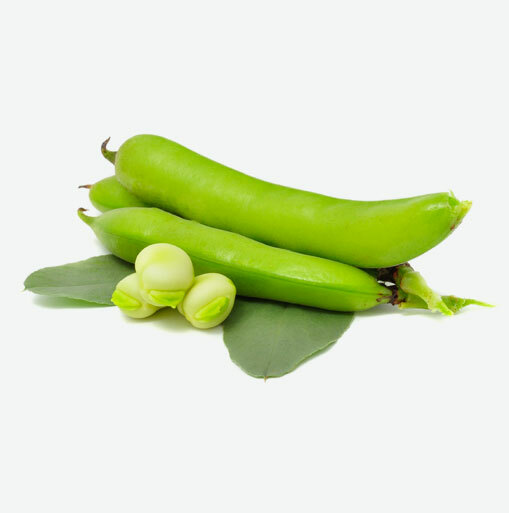 They grow in plump green pods and are also known as broad beans. While usually green, fava beans can also sometimes be reddish brown or purplish. Fava beans are loaded with antioxidants. These beans help to fight carcinogens and reduce the risk of cancer in the digestive tract. Beans contain no cholesterol, and because they are high in fiber, they can help to lower cholesterol. Fava beans and most other beans also contain at least 20% protein and are high in carbohydrates. In addition, fava beans provide essential B vitamins and iron. Adding beans to your meals on a daily basis can improve your diet. When the beans are very young and tender, they may be eaten whole; however, they are usually peeled to avoid any bitterness (caused by the skin). Fava beans are a wonderful addition to any meal and do not require soaking. Serve them as a hot or cold appetizer, as a side dish sautéed in butter or olive oil with garlic, or in soups. Blanch them and add them to salads, add them to rice or pastas, or mash or puree them; use them as you would peas. When you see fava beans are around, you know spring is here!